Before Holly Holm attempts to defend her bantamweight title on Saturday, take a look at the history of UFC women’s title defenses. At UFC 196 on Saturday, current women’s bantamweight champion Holly Holm will look to become just the third woman in UFC history to defend her title. With former bantamweight champion Ronda Rousey recording six title defenses in her career, and current strawweight champion Joanna Jędrzejczyk defending her crown twice, Holm will attempt to record the ninth title defense in UFC women’s division history. Holm (10–0 MMA, 3–0 UFC) faces second-ranked bantamweight fighter Miesha Tate (17–5 MMA, 4–2 UFC) in the bout at MGM Grand Garden Arena in Las Vegas. Before Holm attempts to defend her bantamweight title for the first time, take a look at the history of UFC women’s title defenses. Rousey and Carmouche’s bout was the first-ever women’s fight in UFC history, as well as the first UFC event headlined by two female fighters. Rousey, who was named the UFC’s inaugural champion by president Dana White in 2012, handily took care of Carmouche by way of an armbar with 11 seconds left in the first round. In a rematch of Rousey’s first-round victory over Tate in a 2012 Strikeforce bout, the duo met for the first time on the UFC stage. 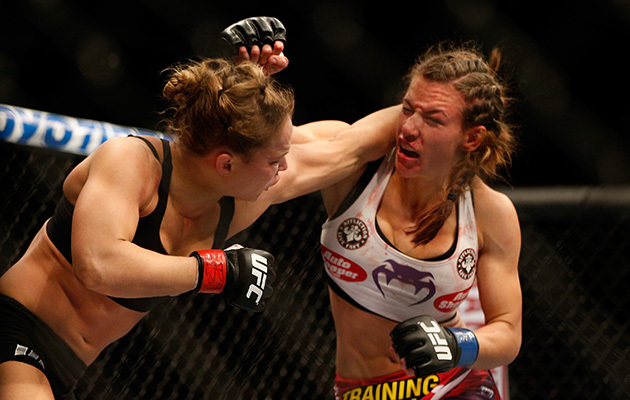 The fight went three rounds before Rousey defeated her rival with an armbar submission. Perhaps the most memorable moment of the matchup was after Rousey’s victory, when Tate extended her hand to the champion, who declined to accept it. Rousey and McMann headlined UFC 170 in Las Vegas. McMann, an Olympic silver medalist in freestyle wrestling, fell to Rousey by TKO in the first round after being hit by a knee to her liver. The stoppage created controversy, as many people, including McMann, believed the fight was called too soon. Rousey answered any doubts about her that resulted from the McCann fight during the co-main event of UFC 175. Against Davis, who was coming off a split-decision victory over Jessica Eye, Rousey dominated, defeating her Canadian challenger just 16 seconds into the first round by way of a knockout. Rousey took even less time to defeat her next opponent, as a then-undefeated Zingano was submitted by Rousey’s armbar just 14 seconds into UFC 184. An undefeated Jędrzejczyk defended her belt for the first time against Penne in the main event at UFC Fight Night 69 in Berlin. Jędrzejczyk was then the newly-crowned strawweight champion, after having defeated Carla Esparza at UFC 185 by TKO to become the UFC’s first European female title-holder. Against Penne, Jędrzejczyk utilized a combination of punches and a knee against the cage to win by TKO in the third round. Like four of her five prior fights, Rousey ended Correia’s title hopes in the first round, knocking out the Brazilian just 34 seconds into the bout. Jędrzejczyk defended her strawweight title for the second time in UFC 193’s co-main event against Valerie Letourneau. In a win by unanimous decision, the Pole landed the most-ever significant strikes in a title bout with 220, as well as the most leg kicks in UFC history with 70.